Caul Pads | DE-COMP Composites, Inc.
CAUL PAD is a non-silicone, uncured rubber which remains pliable and should last several hours at 350°F/177°C before degradation begins. CAUL PAD may be used without fear of contamination, as it contains no silicones or silicates of any kind. 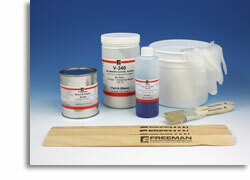 1.Prepare mold surface with release or release film. 2.Cut and apply CAUL PAD to the mold surface with overlapping joints of 1/16″- 1/2″. 3. Vacuum bag with a peel ply, porous TFEG, or perforated release film against the CAUL PAD surface followed by a suitable breather under the bag. 4.Cure in the autoclave at 350°F/177°C for 2 hours at 50-100 psi. 5. All rubbers shrink when subjected to heat. Shrinkage may be minimized by sandwiching peel ply, bleeder fabric, breather fabric, wire mesh, cured laminates prepreg, dry cloth, or foam adhesive with less than 1% volatile content between plies of CAUL PAD. 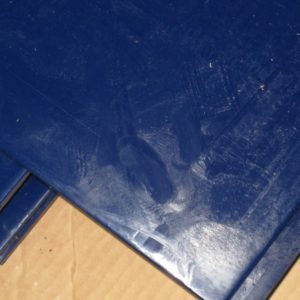 DO NOT cure against mold surfaces treated with silicone bearing compounds. Such materials will permanently contaminate CAUL PAD. Cured parts are excellent molds for first cures. Peel ply, release film or fluorocarbon mold release may be used to prevent CAUL PAD to mold surfaces and / or provide a desired surface text. Uncured CAUL PAD readily vulcanizes to cured CAUL PAD and may be spliced or patched without mark off or additional adhesives. DO NOT cure against peel ply or release fabrics containing silicone. Such materials will permanently contaminate CAUL PAD. CAUL PAD cures to the exact shape of the surface it is cured against. If release materials, used during the first two cures, bridge or wrinkle, CAUL PAD will mold around them.